Market match has been increased to $15 from $10 at North County Farmers Markets that accept EBT! Please help spread the good word! This means $30 worth of local veggies for our CalFresh community members each week! North County Farmers Markets has been utilizing Fini Grant EBT Match at all four of their farmers market locations - Atascadero, Baywood, Paso Robles, Templeton - since April 1, 2016. Word is traveling fast and they are getting new EBT customers at every market. Shoppers are really pleased to get an additional $10 (now $15!) to spend on fresh produce at the markets. Robyn Gable, Market Manager, would encourage anyone who wants to get involved with making EBT available at Farmers Markets to follow through with grant opportunities. Also, markets are always available for anyone interested to see how it works to stop by and they will gladly explain the process. The Wellness Kitchen Children's Program has taught a four module children's cooking class since July, 2015, both in the community (at the Boys & Girls Club) and at The Wellness Kitchen in Templeton. They have a weekly cooking and ordering cycle for all of their foods. Clients order food once per week, which is then prepared and ready to pick up or deliver in a couple of days. The program will soon teach cooking classes in the Paso Robles school district as part of their elementary after-school program (PRYDE). They also are looking forward to working with One Cool Earth gardens to create a garden-to-table program this summer for the PRYDE program. In addition, they aim to develop a separate menu of healing foods for children who are dealing with serious illness and to recruit and train teen interns to prepare that menu. All their recipes are gluten-free, dairy-free, freshly prepared, and with an emphasis on local produce. For more information, visit The Wellness Kitchen website and read this Paso Robles Daily News article. 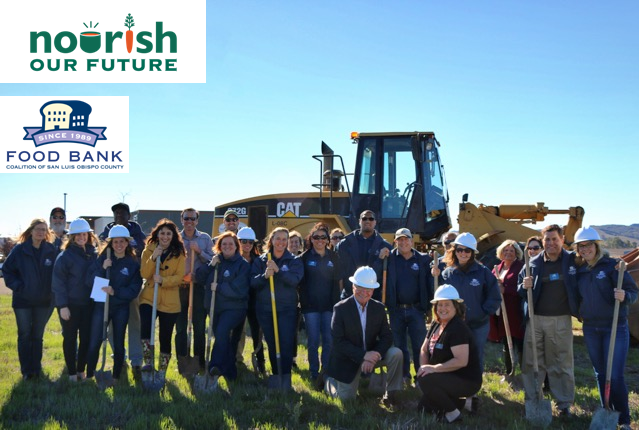 This campaign seeks to raise $2.5 million by summer of 2016 for the development and complete ownership of a new Food Bank facility centrally located in San Luis Obispo, which will be suited to better meet the needs of the local food insecure population throughout the county. For more information or to donate, visit NourishOurFuture.org. What is Children's Farmers Market? The Food Bank Coalition of SLO County partners with schools and after-school programs across the county to provide fresh produce to students in need. Similar to a real farmers market, children are provided a reusable bag and mock money, or "Food Bank Bucks", to be used to choose which produce and the amount they would like to take home to share with their families. The Food Bank also provides nutrition education in the form of enrichment activities to teach children the benefit of choosing healthy foods and shopping from local farmers. The Food Bank truck pulls onto the blacktop at Oceano Elementary and the drivers line up five long tables along the edge of the field while children play. Pallets loaded with boxes of corn and carrots, oranges and pears are taken off the truck. Volunteers from a nearby church and a Boys & Girls Club teen leadership club stack heads of broccoli and bags of pre-cut salad. Soon the tables are filled with boxes and pyramids of fresh fruits and vegetables. The volunteers station themselves behind each type of produce, ready for market day. Each child receives a cloth bag and eight play one-dollar bills. Signs on the boxes tell the children, “8 Pears for $1,” “4 Corn for $1.” As the children walk along the farmers market, they choose which produce to purchase from the volunteers. Exclamations are heard: “Corn! We’re going to have a barbeque!” Children explain to the volunteers, "Yep, I like broccoli. A lot. It makes me grow big like my brother." "I'm picking out onions for my mom... she's the only one who likes onions in my family because they're gross. I'm using the rest of my money for good stuff like apples and corn and PEARS! My mom will be so proud of me." Extra bags are handed out for children determined to spend every dollar. At the end of the tables, the children walk away laden with 15-20 pounds of produce (a $30-$40 value) and big smiles on their faces, knowing they have chosen healthy foods that they love and that will contribute to feeding their families. For more information, visit the Food Bank's website. 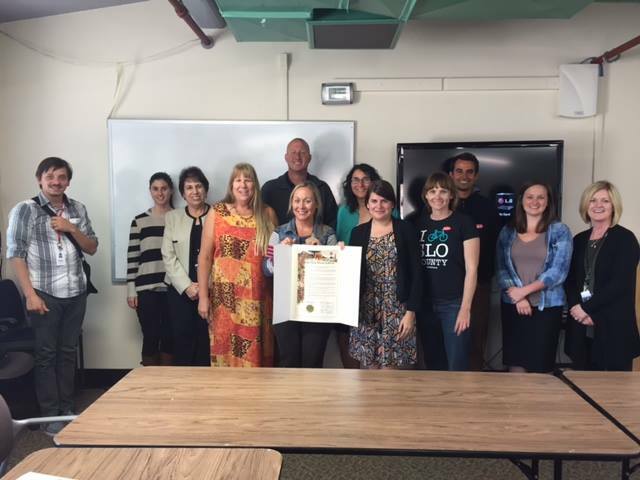 San Luis Obispo County adopted a version of California's statewide Living Schoolyard Month resolution and created a Living Schoolyard Network of SLO County!